Your breathing soon stopped; your eyes closed forever. I found a metal box small enough for your tiny body and placed you inside. I think you had come in search of our aloe blooms … I’m sorry you were months too early. Even though you’re gone now, I hope the crimson of your chest and the blue-green on your back are flashing in other skies … and you’ve got your fill of the sweetness to be found inside salmon-pink and orange trumpets. Who wouldn’t love a hummingbird? — Thanks for commenting! We were too late, but we tried. Thanks for commenting! 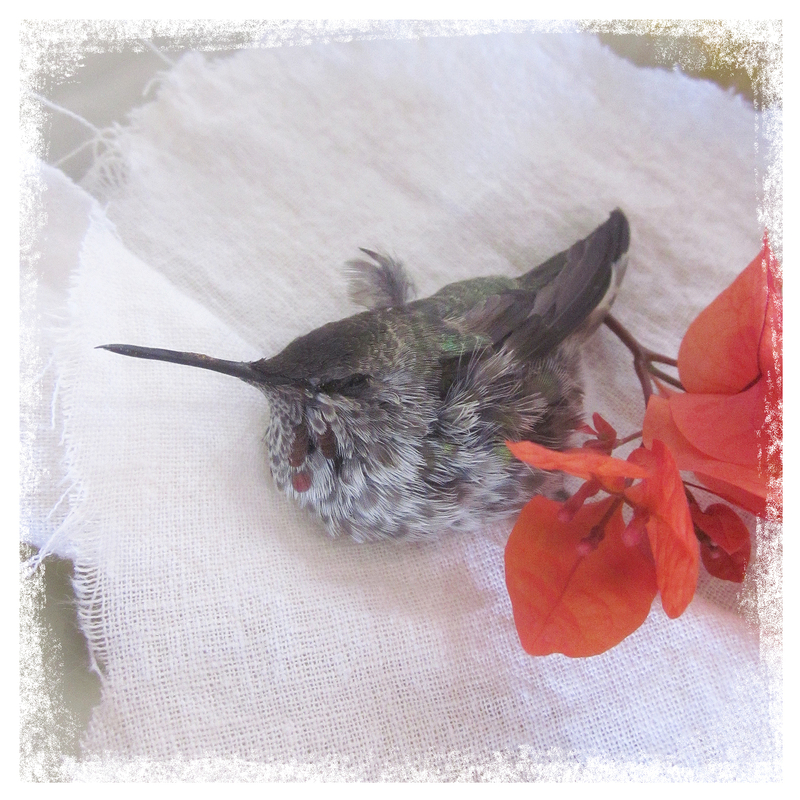 Never seen an hummingbird in my life… it looks so cute, so tiny… I would love to observe such a bird in my garden. I would love to touch him, to hold him in my hand. Au Revoir, fragile Colibri, it was a sad but beautiful ceremony. Delphine, I can’t believe you’ve never seen a hummingbird … I’m wishing one your way. But keep your eyes open, they move super-fast! Hi, Guida, nice to read you … I hope you and Danny are well! what a lovely tribute, thank you for honoring birds and nature the way you do! Now breaks a noble heart! Good night, sweet prince, and flights of angels sing thee to thy rest! So sweet. I’ve revived a couple but never had to put one to rest. Beautifully done, with all the love and respect these magical creatures deserve. At one time we were thinking Casa Colibri might be a good name for our house/garden. I’d forgotten about that until this post. I so agree with all the comments above about the loss of one of our little wonders. I'[ve lived in this house for 32 yrs and have watched many generations grow up around here. I so love watching their sky battles. And all the fancy flights around my plantings. Have managed to plant a fair number of plants that they seem to like. One of my favorite memories of them will always be the one of the day I had to help my mare cross over. As I was sitting in my skychair going thru the yellow pages looking for a vet to come to put her down. My regular vet couldn’t do it. As I sat there a sound started, one I’d not ever heard before. At least not in quite the same way. Turned out that it was a baby hummer that was trying out it’s wings. After I found someone to call and hung up, I was treated to watching this baby’s first flight after the warm up. It was absolutely exhausted when reaching the roof next door. After an afternoon of mom refueling it it made it to my roof and then off to it’s life. I like to think it’s one of the generations that always let me know that the feeders are empty. 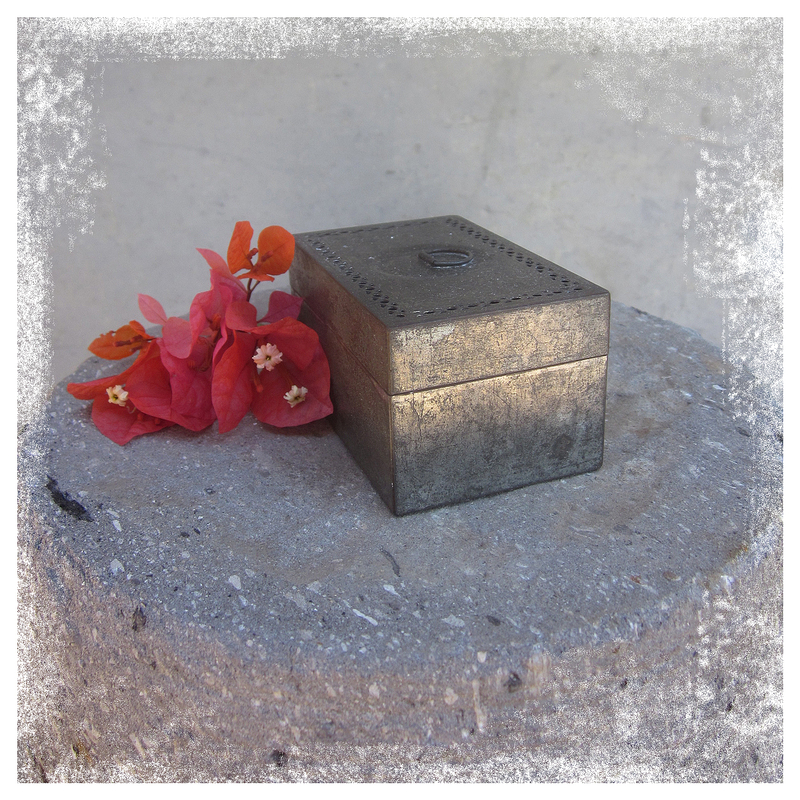 I’ve buried the ones who’ve died here but never with such a pretty box. Vickie, thanks for such an amazingly poignant and personal comment. Really sweet of you to share!